In 2011, after the original Southeastern Michigan based HIKING MICHIGAN. group had grown to over 5,000 members, and after so many requests from other parts of the state kept coming in, we decided it was time to expand our original 8 counties covered Hiking Group, to also cover another 26 counties in the North/Central regions of our state. People all over our beautiful state wanted opportunities to explore and discover the beauties which are Michigan Parks, Forests and rivers. 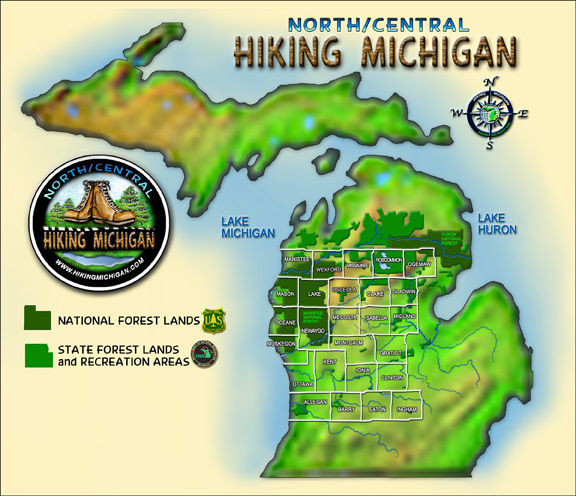 With the many requests we formed the North/Central branch of Hiking Michigan, and planned our first Hike for May 5th along the Pere Marquette river in the Manistee National Forest in Lake county. The response was overwhelming, with 15 different counties being represented at this very first Hike. With more opportunities to Canoe, Kayak, Back Pack, Fish and experience other types of outdoor experiences, along with Hiking, the North/Central branch will be more diversified in it’s outdoor activities. Never forgetting our base in Hiking and exploring the natural world in detail. The S.E.Michigan branch will have access to all the Schedule Hikes and activities that the North/Central Group organizes. This should open up so many experiences to EVERYONE in the lower peninsula to enjoy our beautiful Parks in so many different ways. Come and experience what the 5,000 members in Southeastern Michigan have created and experienced for over 14 years now. A love and respect for the natural world….a Camaraderie with fellow members and Hikers, and a sharing of outdoor knowledge with one another, like no other place you have been. Join Us. It’s all FREE, and EVERYONE is Welcome here.